刘位位, 孙起翔, 张景鸿, 杨霞, 李超乾. 雾化吸入灭活草分枝杆菌对哮喘模型小鼠T-bet/GATA-3表达的影响[J]. 中国药理学通报, 2018, 34(8): 1099-1104. LIU Wei-wei, SUN Qi-xiang, ZHANG Jing-hong, YANG Xia, LI Chao-qian. Effect of inhalation inactived Mycobacterium phlei on T-bet/GATA-3 expression in asthmatic mice[J]. Chinese Pharmacological Bulletin, 2018, 34(8): 1099-1104. Abstract: Aim To investigate the effect of inhalation of inactivated Mycobacterium phlei on the expression of T-bet/GATA-3 in asthmatic mice, and to understand the immunoregulatory mechanism of Mycobacterium phlei. Methods Twenty-four male Balb/c mice were randomly divided into normal group, asthma group and treatment group. Asthmatic model was established by ovalbumin (OVA), and the treatment group was inactivated by Mycobacterium phlei after OVA challenge for five days, 1 time a day. The lung tissues and bronchoalveolar lavage fluid (BALF) were harvested. Lung inflammation changes were observed by HE staining and periodic acid Schiff (PAS) staining. The levels of IFN-γ and interleukin(IL)-4 in BALF were measured by ELISA. The levels of T-bet, GATA-3 mRNA expressions in lung tissues were determined by real time-PCR. The percentage of Th1 and Th2 cells in CD4+T cells in lung mononuclear cells was detected by flow cytometry. Results Mycobacterium phlei treatment alleviated lung inflammation and attenuated mucus production. 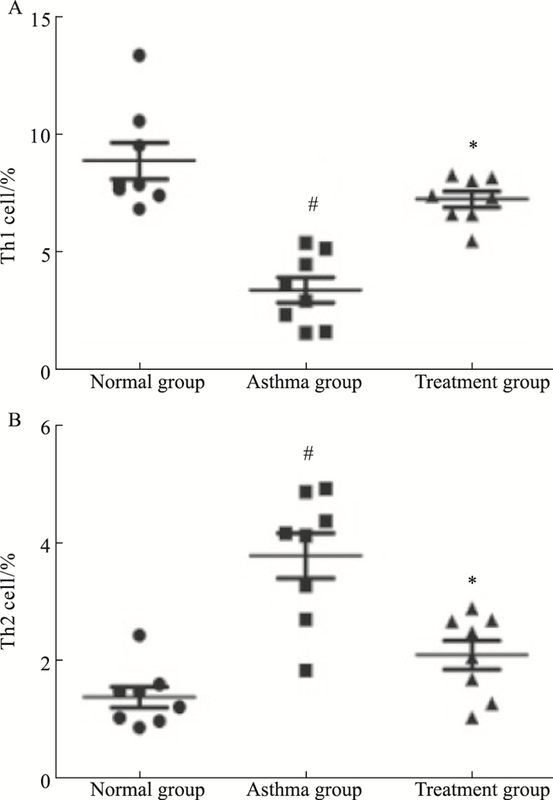 Compared with normal group, the asthma model group significantly decreased IFN-γ, T-bet mRNA levels and percentage of Th1 cells(P < 0.05) and significantly increased IL-4, GATA-3 mRNA levels and percentage of Th2 cells(P < 0.05). Compared with asthma model group, treatment group significantly increased IFN-γ, T-bet mRNA levels and percentage of Th1 cells(P < 0.05) and significantly decreased IL-4, GATA-3 mRNA levels and percentage of Th2 cells(P < 0.05). Correlation analysis showed that the levels of T-bet mRNA in lung tissues were positively correlated with the percentage of Th1 cells(r=0.7, P < 0.01), while the levels of GATA-3 mRNA were positively correlated with the percentage of Th2 cells(r=0.76, P < 0.01). Conclusions Inhalation of inactivated Mycobacterium phlei could alleviate airway inflammation in asthmatic mice. It can inhibit the secretion of Th2 cytokines by increasing T-bet mRNA expression, while inhibiting GATA-3 mRNA expression at transcriptional level. 李良昌, 朴红梅, 延光海, 等. 芝麻素抗哮喘炎症作用研究[J]. 中国药理学通报, 2015, 31(3): 411-5. Li L C, Piao H M, Yan G H, et al. Sesamin attenuates inflammation response in a murine model of asthma[J]. Chin Pharmacol Bull, 2015, 31(3): 411-5. 赵德育. 支气管哮喘患儿长期吸入糖皮质激素的安全性研究进展与对策[J]. 中华实用儿科临床杂志, 2013, 28(4): 249-51. Zhao D Y. Research progress and safety of long-term inhaled corticosteroids in children with bronchial asthma[J]. Chin J Appl Clin Pediatr, 2013, 28(4): 249-51. Ming M, Luo Z, Lv S, et al. Inactivated Mycobacterium phlei inhalation ameliorates allergic asthma through modulating the balance of CD4+CD25+ regulatory T and Th17 cells in mice[J]. Iran J Basic Med Sci, 2016, 19(9): 953-9. 潘小晶, 王锁英, 许化溪, 等. T-bet基因传递对支气管哮喘模型小鼠T淋巴细胞亚群的免疫调节作用[J]. 中华实用儿科临床杂志, 2013, 28(4): 281-4. Pan X J, Wang S Y, Xu H X, et al. Immunoregulation effect of transmission of T-bet gene on T cell subgroups in asthmatic Balb/c mice[J]. Chin J Appl Clin Pediatr, 2013, 28(4): 281-4. Yong J, Chen G Q, Huang B, et al. Correlation between the ratio of T-bet/GATA-3 and the levels of IL-4 and IFN-gamma in patients with allergic asthma[J]. Mol Med Rep, 2011, 4(4): 663-6. 张琦, 董亮, 李丽珍, 等. 以T-bet/GATA-3的比率作为评价哮喘患者Th1/Th2失衡指标的探讨[J]. 细胞与分子免疫学杂志, 2005, 21(1): 118-9, 122. Zhang Q, Dong L, Li L Z, et al. Evaluation of Th1/Th2 imbalance index in asthma patients by using T-bet/GATA-3 ratio[J]. Chin J Cell Mol Immunol, 2005, 21(1): 118-9, 122. 姚斌, 李敏, 庞英. 草分枝杆菌对哮喘小鼠CD4+CD25+调节性T细胞和Th17细胞平衡的影响[J]. 中国当代儿科杂志, 2013, 11(15): 1018-22. Yao B, Li M, Pang Y. Effect of Mycobacterium phlei F.U.36 on balance of CD4+CD25+ regulatory T cells and Th17 cells in asthmatic mice[J]. Chin J Contemp Pediatr, 2013, 11(15): 1018-22. Chinese Pharmacological Bulletin, 2018, 34(8): 1099-1104.